I was recently commissioned to design a nature board for a meadow in Hampshire. I’d hoped to get Richard Lewington to do the illustrations but unfortunately he was too busy working on other projects. I tried another illustrator but sadly that didn’t work out so ended up doing them myself. There were twelve in total including a couple of beetles. 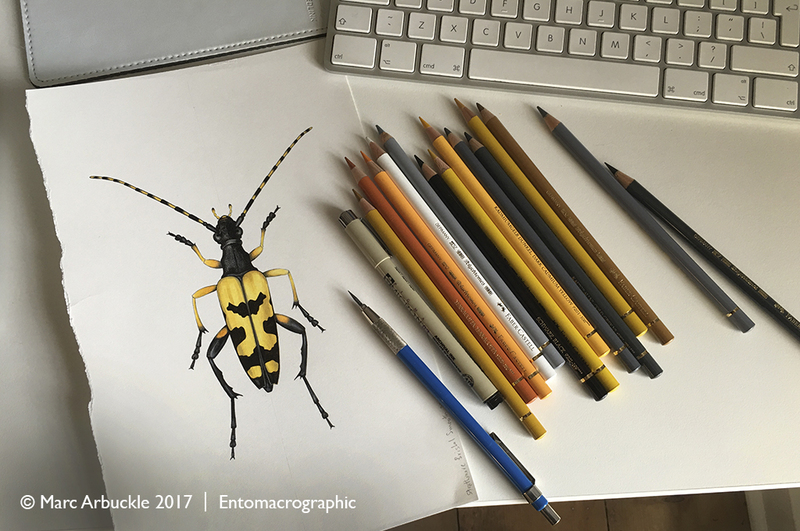 The Black and yellow longhorn beetle Rutpela maculata is pictured above. Previously I’ve always used designer’s gouache but after trying a variety of styles and techniques I finally opted for Faber Castell Polychromous coloured pencils and Pigma Micron archival ink on Strathmore Bristol Smooth paper. Surprising really as I’ve never used coloured pencils before.